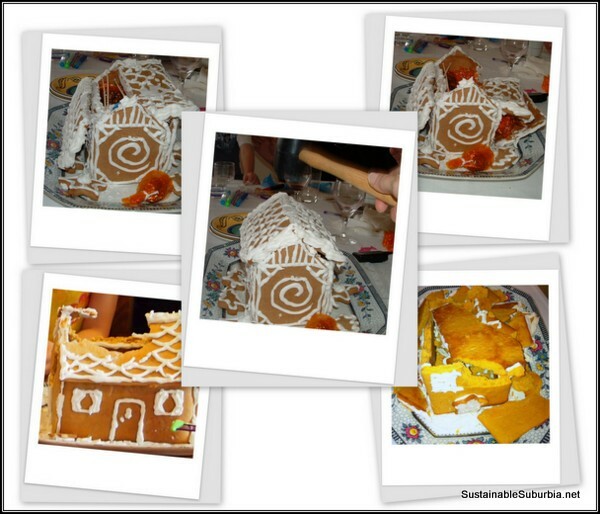 Making a gingerbread house has become a bit of a tradition in our household, and last year we perfected the recipe. So here’s how to make one from scratch. Note: You don’t make a gingerbread house from scratch in one sitting. The dough needs to be refrigerated before rolling out, the pieces need to harden overnight before you can put it together, and then the walls need to be left to harden before the roof is attached, and the whole thing needs to harden before decorating. It’s a bit like building a real house… lots of patience is required! Also note: If, like me, you prefer to decorate just with icing (ie no lollies pressed in), children will have a hard time helping. The royal icing is thick and hard to pipe for small hands. *A note on teaspoon and tablespoon measures: I use Australian metric measures. That means one teaspoon (tsp) is 5ml, and one tbsp is 4 tsp or 20 ml. In US measurements a tbsp is just under 15ml in the UK it is about 17ml. Adjust accordingly. To make the end wall pattern, tape together the rectangular end wall and the triangular gable piece. The long side of the triangle should match up to one of the 12cm sides of the end wall. Hint: Label your pattern pieces and store them in the back of a recipe book to use again next year. 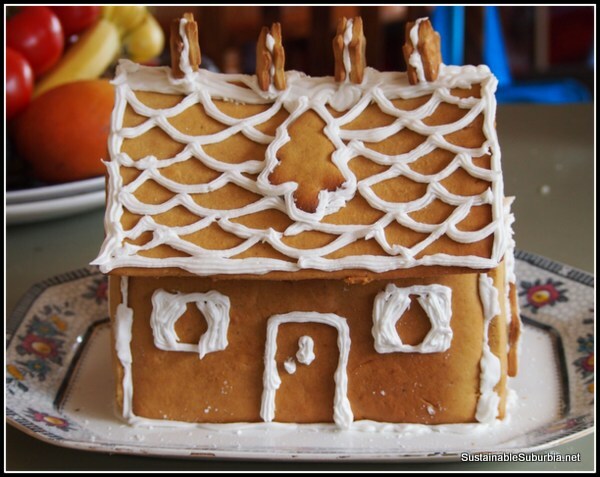 There is a lot of dough to roll out when you are making a gingerbread house, so make it fun – sing as you go! Using a large bowl, cream together butter and sugar until fluffy. Stir in the lemon juice, lemon rind and agave syrup. Gradually beat in the 2 eggs. In a separate bowl, sift the flour, baking powder and spices together. Stir the sifted dry ingredients into the wet. Add more flour to make a firm dough, if necessary. Wrap dough and refrigerate for 1 hour. This will make it easier to work with when you are rolling it out. While you are waiting for the dough to harden in the fridge, you can grease two baking trays (cookie sheets) and preheat the oven to 190C. You can probably also do the dishes and have a cup of tea. Divide the dough into 6 portions, 2 slightly larger than the others. Tip: You can put the portions you are not currently using back into the fridge, to making them easier to work with. On a lightly floured surface, roll out the 4 smaller pieces to approximately the size of the side wall and the end wall with gable templates; cut out two of each, keeping the offcuts. You can cut out a door or window at this point if you want to. Don’t make them too big though, or you will risk the structural integrity of your house! 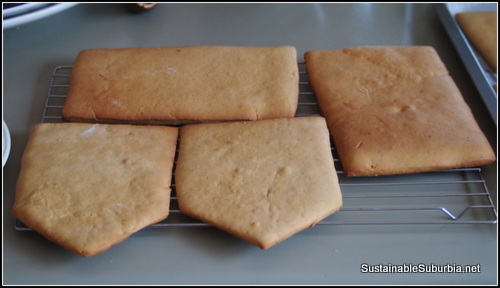 Roll out the remaining 2 portions of dough and cut the two rectangular roof pieces. Carefully transfer onto 2 greased baking trays. Bake gingerbread for 10 minutes, or until crisp, at 190C. Leave the gingerbread on the baking trays for a few minutes before transferring to a wire cooling rack. Leave out overnight to harden. First, you will need some kind of tray for your house. The traditional thing is to use a foil lined cake board, but it you don’t have one you can use a platter, as I have in the picture above, as long as it has a flat surface of at least 23x13cm for the house to sit on. You could also use a foil lined baking tray. Now, make the cement (icing) and build the walls. In another large bowl, lightly whisk two egg whites. Gradually beat in about 5 cups (660g) of icing sugar. The icing should be smooth and form firm peaks. Now pipe or spread a 23cm line of icing onto your tray, for the back wall. Press in one of the side walls so that it stands upright. Add extra icing along either side to support it if necessary. Pipe another line of icing at right angles to the first one, coming out about 12 cm. Take one end wall and spread icing along both the side edges, then press it down into position, attaching it to your back wall as you do. Repeat with your front and other end wall. Ta da! You now have a roofless gingerbread house. But, it’s still a little fragile. Let the walls stand and the icing harden for, ideally, at least a couple of hours before adding the roof. Now, spread or pipe a thick layer of icing on top of all the walls. Place the roof pieces in position, so that they overlap the walls to make the eaves. Carefully press them into place. Now, ideally you should leave the whole thing overnight to set before decorating. I am not always this patient however, and how important this step is will depend a little on your planned decorations and whether children will be helping. Do leave it for another couple of hours though. To make the icing for decorating, repeat the instructions above, using the remaining 2 egg whites and 5 cups of icing sugar. Now decorate your house however you like! Lots of gingerbread houses are covered in icing and decorated with lollies. I prefer less sugar in mine, so we keep the decorations more minimalist, and it’s never bothered my kids. If you want to cover the whole roof with icing (as though it’s covered in snow), you will probably need about half as much icing again. You can also dust the whole house with sifted icing sugar for that snowy on effect. ← How to Make a Homemade Solar Oven, out of Cardboard!